We routinely turn to acid-reducing medications for reflux and heartburn, yet most people with GERD aren’t producing excess stomach acid in the first place. In fact, good, strong stomach acid is crucial for good digestion, and long-term use of acid-reducers can promote serious problems. GERD usually stems from other issues and we may better support long-term health by tackling its true root causes. What is GERD and How Common is it? Gastroesophogeal Reflux Disease (GERD) is when our stomach acid chronically flows up into our esophagus and sometimes our throat. This causes reflux, heartburn, indigestion, coughing, and other irritating symptoms. GERD is one of the most common digestive disorders in the U.S., experienced by 25%-35% of the population. Rates have risen 300%-500% over the last 30 to 40 years. It’s often assumed that GERD is caused by excess stomach acid production, thus typical treatments aim to suppress it. Common acid-reducing medications include proton-pump inhibitors (PPIs) (Prilosec®, Prevacid®, and Nexium®); H2 blockers (Zantac® and Pepcid®); and antacids (Tums® and Alka-Seltzer®). Americans spent $13B on acid medications in 2006. PPIs are one of the most commonly prescribed medications, with almost 20% of post-menopausal women regularly using them. Stomach acid production is rarely measured prior to prescription of acid-reducers. Without measuring it, how do we know it’s too much? Since stomach acid is not usually produced in excess, this is unlikely to be the root cause of GERD. Studies show that typical doses of acid-reducers (20-40 mg of Prilosec, e.g.) can virtually eliminate stomach acid production altogether. Long-term acid-suppression could lead to osteoporosis, infections, pneumonia, digestive issues, immune problems, cancer, dementia, nutrient deficiencies, difficulty detoxing, and more. When using acid-reducers long-term, our body actually grows extra acid-producing tissue to compensate. Discontinuing the medication can then lead to strong rebound symptoms, creating lifelong dependence. PPIs do not provide adequate symptom relief for up to 40% of GERD patients. Like any symptom-suppressing medication, acid-reducers may make the underlying condition worse. All that being said, we must not ignore GERD symptoms. GERD shouldn’t be taken lightly, as it often indicates poor digestive health and can lead to asthma, Barrett’s esophagus, cancer, lung problems, and vocal chord damage. 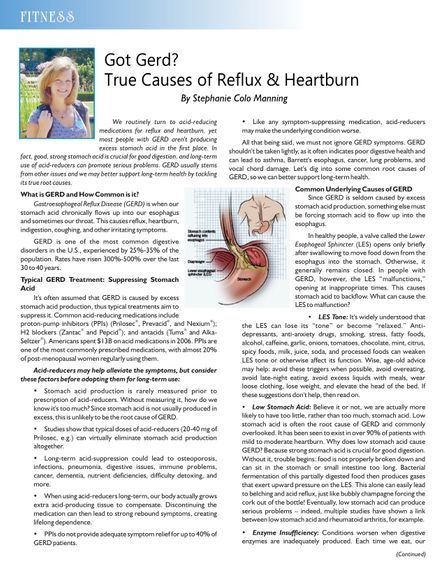 Let’s dig into some common root causes of GERD, so we can better support long-term health. Since GERD is seldom caused by excess stomach acid production, something else must be forcing stomach acid to flow up into the esophagus. In healthy people, a valve called the Lower Esophogeal Sphincter (LES) opens only briefly after swallowing to move food down from the esophagus into the stomach. Otherwise, it generally remains closed. In people with GERD, however, the LES “malfunctions,” opening at inappropriate times. This causes stomach acid to backflow. What can cause the LES to malfunction? LES Tone: It’s widely understood that the LES can lose its “tone” or become “relaxed.” Anti-depressants, anti-anxiety drugs, smoking, stress, fatty foods, alcohol, caffeine, garlic, onions, tomatoes, chocolate, mint, citrus, spicy foods, milk, juice, soda, and processed foods can weaken LES tone or otherwise affect its function. Wise, age-old advice may help: avoid these triggers when possible, avoid overeating, avoid late-night eating, avoid excess liquids with meals, wear loose clothing, lose weight, and elevate the head of the bed. If these suggestions don’t help, then read on. Low Stomach Acid: Believe it or not, we are actually more likely to have too little, rather than too much, stomach acid. Low stomach acid is often the root cause of GERD and commonly overlooked. It has been seen to exist in over 90% of patients with mild to moderate heartburn. Why does low stomach acid cause GERD? Because strong stomach acid is crucial for good digestion. Without it, trouble begins: food is not properly broken down and can sit in the stomach or small intestine too long. Bacterial fermentation of this partially digested food then produces gases that exert upward pressure on the LES. This alone can easily lead to belching and acid reflux, just like bubbly champagne forcing the cork out of the bottle! Eventually, low stomach acid can produce serious problems – indeed, multiple studies have shown a link between low stomach acid and rheumatoid arthritis, for example. Enzyme Insufficiency: Conditions worsen when digestive enzymes are inadequately produced. Each time we eat, our stomach acid is supposed to trigger the release of digestive enzymes to further break down our food into tiny nutrients. This allows us to absorb and make use of these nutrients. However, if we have low stomach acid (or GI inflammation, lactose intolerance, or bacterial overgrowth) our enzymes are not properly released and cannot go to work. Poorly digested food ferments to cause GERD, belching, gas and bloating. This can go on to provoke more serious digestive issues, food allergies, autoimmune diseases, nutrient deficiencies, and skin, nail, joint, and thyroid issues. Infection: GERD can also be caused by overgrowth of H. Pylori (which is the #1 cause of ulcers) or other bacteria, yeast, or parasites in the GI tract. These “bugs” produce toxic byproducts that create inflammation, bloating and pressure (think champagne bottle again.) They especially love to take hold after antibiotic or steroid use, and they thrive in low acid environments. These freeloading bugs multiply in our gut as they feast on the sugars, refined carbs, starches, and processed foods we eat. Food Sensitivities and Allergies: Gluten sensitivity and celiac disease often produce GERD, and a gluten-free diet frequently resolves symptoms. 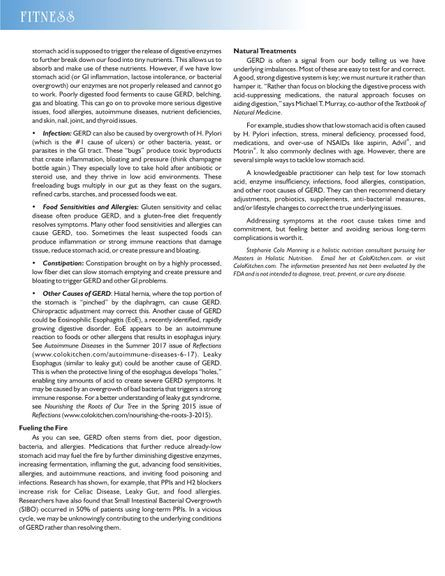 Many other food sensitivities and allergies can cause GERD, too. Sometimes the least suspected foods can produce inflammation or strong immune reactions that damage tissue, reduce stomach acid, or create pressure and bloating. Constipation: Constipation brought on by a highly processed, low fiber diet can slow stomach emptying and create pressure and bloating to trigger GERD and other GI problems. Other Causes of GERD: Hiatal hernia, where the top portion of the stomach is “pinched” by the diaphragm, can cause GERD. Chiropractic adjustment may correct this. Another cause of GERD could be Eosinophilic Esophagitis (EoE), a recently identified, rapidly growing digestive disorder. EoE appears to be an autoimmune reaction to foods or other allergens that results in esophagus injury. See Autoimmune Diseases in the Summer 2017 issue of Reflections (www.colokitchen.com/autoimmune-diseases-6-17). Leaky Esophagus (similar to leaky gut) could be another cause of GERD. This is when the protective lining of the esophagus develops “holes,” enabling tiny amounts of acid to create severe GERD symptoms. It may be caused by an overgrowth of bad bacteria that triggers a strong immune response. For a better understanding of leaky gut syndrome, see Nourishing the Roots of Our Tree in the Spring 2015 issue of Reflections (www.colokitchen.com/nourishing-the-roots-3-2015). As you can see, GERD often stems from diet, poor digestion, bacteria, and allergies. Medications that further reduce already-low stomach acid may fuel the fire by further diminishing digestive enzymes, increasing fermentation, inflaming the gut, advancing food sensitivities, allergies, and autoimmune reactions, and inviting food poisoning and infections. Research has shown, for example, that PPIs and H2 blockers increase risk for Celiac Disease, Leaky Gut, and food allergies. Researchers have also found that Small Intestinal Bacterial Overgrowth (SIBO) occurred in 50% of patients using long-term PPIs. In a vicious cycle, we may be unknowingly contributing to the underlying conditions of GERD rather than resolving them. GERD is often a signal from our body telling us we have underlying imbalances. Most of these are easy to test for and correct. A good, strong digestive system is key; we must nurture it rather than hamper it. “Rather than focus on blocking the digestive process with acid-suppressing medications, the natural approach focuses on aiding digestion,” says Michael T. Murray, co-author of the Textbook of Natural Medicine. For example, studies show that low stomach acid is often caused by H. Pylori infection, stress, mineral deficiency, processed food, medications, and over-use of NSAIDs like aspirin, Advil®, and Motrin®. It also commonly declines with age. However, there are several simple ways to tackle low stomach acid. A knowledgeable practitioner can help test for low stomach acid, enzyme insufficiency, infections, food allergies, constipation, and other root causes of GERD. They can then recommend dietary adjustments, probiotics, supplements, anti-bacterial measures, and/or lifestyle changes to correct the true underlying issues. Addressing symptoms at the root cause takes time and commitment, but feeling better and avoiding serious long-term complications is worth it. Stephanie Colo Manning is a holistic nutrition consultant pursuing her Masters in Holistic Nutrition. Her experience in food and catering, engineering and marketing, and managing her own autoimmune disease have converged into a passion for helping people achieve and maintain optimal health. Email her at ColoKitchen@gmail.com or visit ColoKitchen.com. The information presented has not been evaluated by the FDA and is not intended to diagnose, treat, prevent, or cure any disease.